I decided to revisit a couple of my favorite bars today in the area close to where I live. The first one is a small place with now name out front. 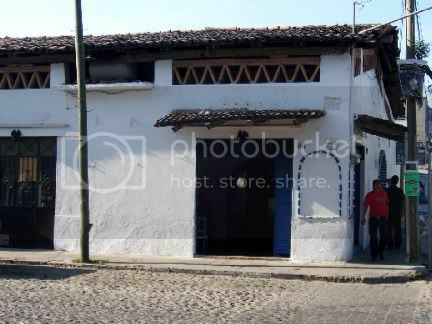 As you may recall, last year I found out that the name of this place is La Gloria de Infierno or The Glory of Hell. It sounds much worse than it is. It is actually just a small place with a couple of tables and a cement bar in the back. You don’t see many tourists in here, in fact I have never seen any except me and whoever I come in with. Last year the crowd was a bit surly, but this year they seemed friendly enough. The bartender is always friendly, but I suspect that is because we actually pay for our drinks and leave tips as well. He honored our presence with a bowl of free peanuts. They had really neat shot glasses in here although shot glasses might be a misnomer; they hold much more than a shot. Big and heavy and the bartender poured with a heavy hand. 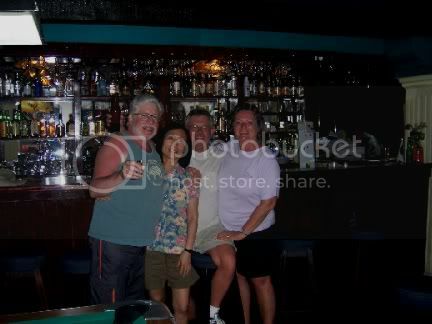 My friend Sandy asked if we could buy a couple and the bartender sold us three of them for 20 pesos each. We had a couple of beers and a couple of “shots” of tequila in here and then headed to another favorite of mine a couple of blocks away. This one is now Rojan, but it has had a number of different names over the years. The first time I came here it was the Corner Bar. 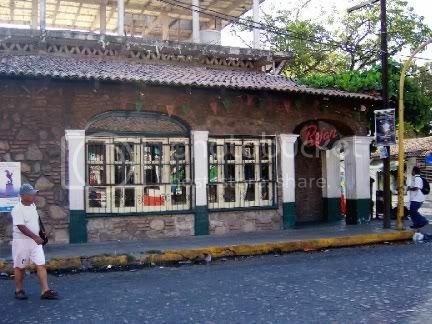 It was the first bar that I visited, many years ago, on the south side of Rio Cuale where I now reside while I am here. At that time there was almost nothing over here in terms of places for tourists, it really was out of the way. Now it is jumping although still not as built up as the other side of the river. 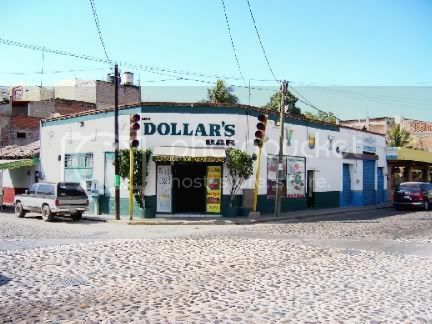 One night, before I moved into this area, a couple of buddies and I hit this bar late at night at found out that it had become a gay bar for Mexicans, and a bit of a rough one at that, think cowboys in leather. And this was way before Brokeback Mountain, which is actually about gay shepherds, not cowboys. It seems like every year the name of the place changes and there is a shift in the clientele. It isn’t exactly a touristy place, but it really isn’t a place for locals either. Kind of dead during the day but it livens up at night when they sometimes have live music. The décor of the bar hasn’t changed much over the years except there is no longer a woman who makes tacos. They have added a pool table and you can shoot for free, at least during the day. When we stopped in there in mid-afternoon there was only one other customer, a local. The bartender was really friendly though and we ingested a few more tequilas than were probably good for us, but what else is new. The bartender actually gave us a shot glass for some reason. They get them for free from the liquor distributors anyway and I am sure plenty of them get stolen. I doubt if anyone would try to steal one from La Gloria de Infierno though, I know I wouldn’t try. We hit a few more places during the day including a pool hall where we had a couple of beers, but these were my favorites and I thought I would share them with you. I forgot the recharger for my new camera, a Kodak V550, and it doesn't take regular batteries so unless I find a place that sells the battery it takes or find someone with the same camera and a recharging cable I am done taking pictures this year. Of course I also left my old camera at home so I don't even have a backup. Now you know why I don't do this as a profession. No, no, not really. It is really Bucerias. I went out there last year, you may recall and the trip was pretty much the same except the local bus that takes you to where you get the bus to the town has raised the fare to 4.5 pesos, or about forty cents. 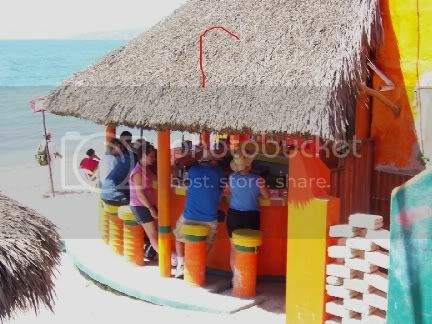 Then about another 95 cents to get you to Bucerias. Well worth the money for a bit of an adventure. There are a lot of little stalls with vendors selling just about the same stuff you can get in Puerto Vallarta, some of it cheaper, some of it not as cheap. A lot depends upon how much time you are willing to spend bargaining with them. For example, a friend of ours who just came back from China bought some bracelets while she was there for ninety cents. The offering price from a vendor who had the exact same bracelets was 200 pesos or about 18 dollars. Spend enough time and you might get the price down to 20 pesos. 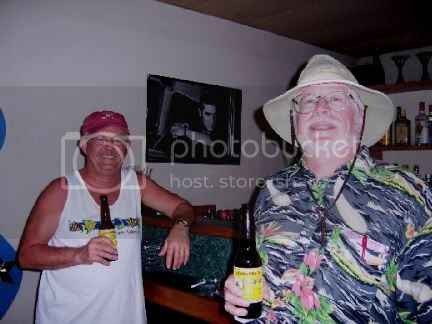 Well, after a long bus ride my buddy Rico and I were a bit thirsty so we decided to head to a bar on the beach for a few beers while the women did some shopping. 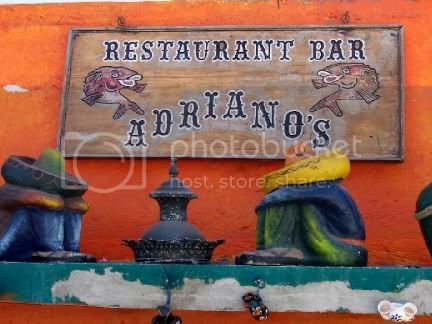 The first bar we came to was Andriano's, and it suited us just fine. After a bit they joined us so we all sat and enjoyed the sun, the surf, and the suds. 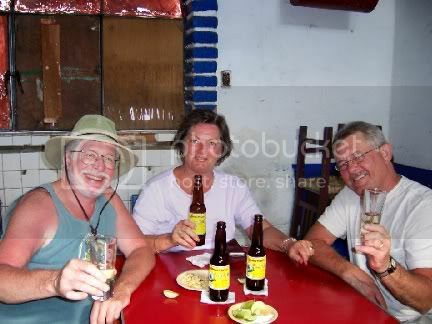 The bartender was from Canada and just came down to Mexico in the winter. I would stop in at the bars and if a bartender didn’t show up for work, not an uncommon occurrence I gather, he would fill in for him. Not a bad deal, it paid for his beers he said. 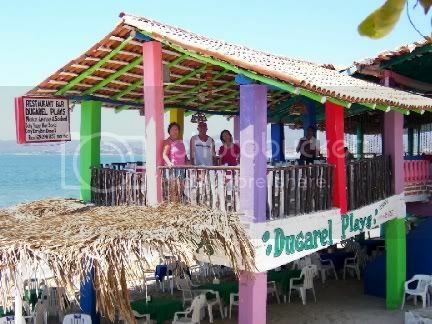 After we finished our beers we headed to my favorite restaurant in Bucerias, Dongarel Plays. I think that is phonetic for “Doagarel Place.” I usually just call this the slanty place because as you look at it from the sidewalk it appears that the deck is, indeed, slanty. We were going to meet some friends of ours, Steve and Allison, for lunch but they couldn’t make it because Allison had to pick her sister up from the airport. 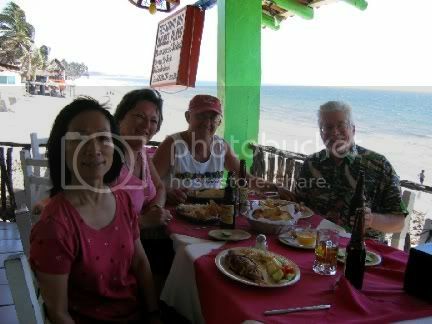 It didn’t affect our appetites at all and we all tucked into our meals and had a great time. There was a stiff wind blowing which was nice because the one drawback of this place is that sometimes a lot of flies like to join you for lunch. There were none this year. After our meal we headed back into town. The bus back goes in further than where you pick up the one coming out so we rode it to the end where it pulls into the bus depot. It was still a bit of a hike back to our place but we decided we could use the exercise. Of course we couldn’t make it all the way back without at least one stop. We passed by New Dollar Bills and it was open. In years past I have never seen this place open for business, either because it opens late or because it was just closed for some reason. I guess the fact that it is now “New” Dollar Bills means that it has new management and actually is open for business during the day. It was even open in the morning when we were heading out. It is just your typical small Mexican bar that is kind of dark and a good place for a beer, which is what Rico and I decided to have, with Elvis looking on. 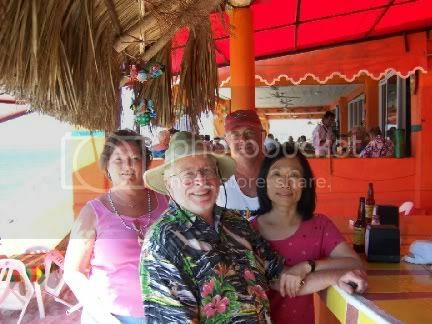 A fun day and we got back in time for sunset drinks out by the pool at our Playa del Sol where I have my place. 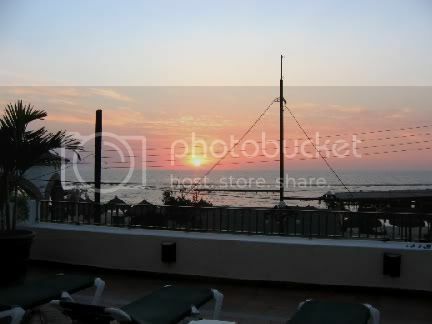 It overlooks Playa Los Muertos or, in English, either Beach of The Dead or Dead Man’s Beach, depending upon who you ask.